We have three separate chapters of HOSA for our three distinct medical programs. Click the logo for more information on HOSA. -Anna C. and Hillary H. competed in HOSA State Leadership Conference Saturday, March 12, 2016, at Marshall University. The students competed in Post-Secondary division of Medical Innovation and won 1st place. -Olivia Maroney won WV HOSA State Treasurer and placed 3rd in Job Seeking Skills. She will be representing Ben Franklin Career Center at International HOSA in Nashville, TN in June. Chloe Gilbert received 2nd place for her Extemporaneous Health Poster and Dakotah Smith , Laura Talbert , and Victoria Martin placed 3rd for Community Awareness. 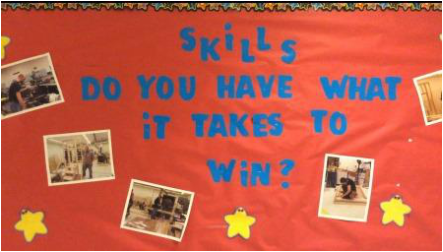 We actively participate in SkillsUSA competitions yearly. For more information on what Skills is all about, click on the logo. The site for information regarding the WV organization and competitions. Ben Franklin students, Secondary and Adult, participated in the WV State Skills USA Competition. Students demonstrated exceptional skill and professionalism. ​Many thanks to Mr. Cole, Mr. Linger nd Mr. Spitzer for chaperoning this group of exceptional young people.